When simultaneously considering multiple stressors across entire communities, the exposure information required is rarely available. However, a number of geospatial data resources can be used to determine exposure to an array of stressors at varying levels of geographic resolution. These databases contain information about socio-demographics, housing characteristics, and behaviors, which can be used to build models that predict chemical and non-chemical stressor exposures. Moreover, using spatial microsimulation techniques, it is possible to develop databases of simulated individuals with a set of defined attributes (e.g., age, race/ethnicity, gender, income, basic home attributes) at high spatial resolution. To our knowledge, our research group was the first to apply these microsimulation techniques to model environmental stressors and to consider the implications for cumulative health risks among health-disparate populations. We have also developed and applied novel methods to quantify EHDs and the extent to which interventions can address those disparities, building on indicators used for health and income inequality but explicitly taking into account important attributes of environmental exposures. In the Mapping Spatial Patterns in Environmental Health Disparities (MAP-EHD) study (Project 3), we are integrating multiple novel analytical techniques in order to predict a number of exposures, behaviors, health outcomes, and other attributes that contribute to EHDs in Massachusetts (MA), and to characterize the nature and extent of these disparities. We are estimating exposures to numerous chemical and non-chemical stressors across MA based on readily available geographical databases and novel approaches to obtain high-resolution data. 1) Characterize disparities in exposure to chemical and non-chemical stressors across MA. 2) Develop and evaluate multivariable chemical and non-chemical stressor constructs to better characterize exposures hypothesized to be related to EHDs in MA. 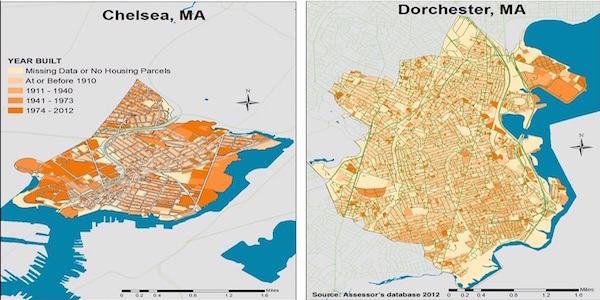 3) Develop models of cumulative risk for multiple health outcomes across the life course (e.g., infant anthropometrics, child growth curves, and adult cardiovascular disease deaths) in Chelsea and Dorchester, MA. Interested in participating in our study? ¿Interesado en participar en nuestro estudio?